This Economy Saver 3-1/2" Diameter HSS Segment Saw Blade is perfect for making precise cuts in nail embedded wood, drywall and plastic materials. This circular cutter has an off-set center attachment which allows the blade face to be placed flat on your control surface for true flush cutting. 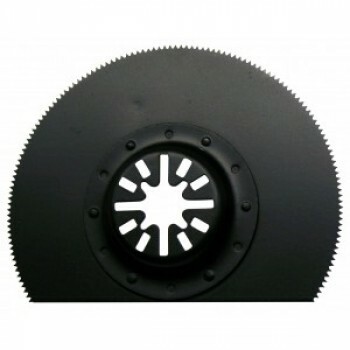 This blade is well suited for cutting drywall, plastics, thin sheet metal, copper and aluminum. Use this blade for those longer span panel cuts because a circular blade allows for greater control and stability as you follow a cut line. Applications include cutting out floor vents, repairing damaged flooring planks and under cutting door jambs. The segmented flat side of this blade allows you to cut to the corners or close to other surfaces without over-cutting. 7/8 inch depth of cut maximum.